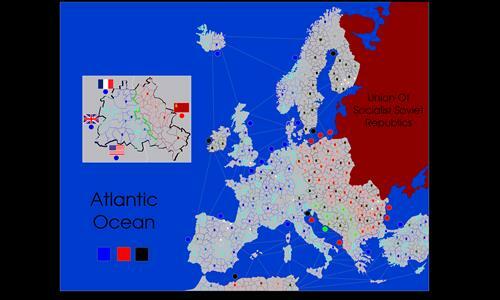 A map of Europe during the Cold War, for much of the 20th century. Unfortunately I was unable to include the USSR as player-controllable on this map due to the 2 MB limit on map size. I initially did plan to include it, and I drew the shape for it, but I just didn't have enough space in the end. By the time I had the rest of europe drawn, I was already at 1100 territories, and only slightly below the 2MB limit. Review by Mudderducker on 7/15/2015. Its not possible to make a large map with this much detail. You have added too much detail to your territories. Consequently, it seems a little silly that you haven't included Russia and the territories now are a little messy. Overall however, its solid and its a good idea (despite the masses of Euro maps). Review by Nathan on 7/15/2015. Fun map. The inset of Berlin is done very well. As noted above, this map really needs the USSR. You could probably get rid of some of the artwork and smooth out the nodes in your territories to free up the necessary memory. After all - there are some maps with nearly 3K territories. Arbre in Sweden (Gavleborg) should connect to Hamman, but doesn't. Also, I feel like Funen County should connect to West Zealand County (Denmark). Review by couleguy on 8/16/2015. Review by A_B3 on 12/23/2017. A great map. Leave Berlin for last. Review by okasan on 7/15/2015. Great lay-out but the game-play in the default setting against the AI suffers from a fatal flaw: the AI is positioned too close to the player, and the game is over after 15 moves or less, with only 70 countries conquered. Kinda defies the point of having a large and beautiful map. For those of us who can't change settings, would be lovely if you could change the default setting (and perhaps also allow more AIs). I, as the map creator, have very little control over what settings you use; In fact, the only one I have even the slightest margin of control over is the default distribution, which anyone can change, and which I have not set. This is why there is a note to not rate a map based on the settings of your game.